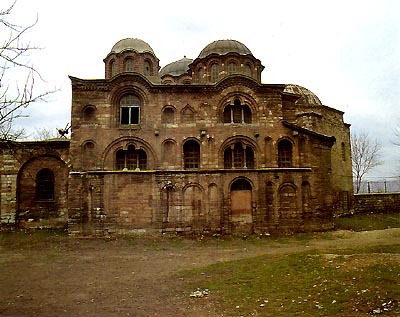 Pammakaristos Church, also known as the Church of Theotokos Pammakaristos (Joyous Mother of God), later known as Fethiye Mosque and today partly a museum, is one of the most famous Byzantine churches in Istanbul. The parekklesion, besides being one among the most important examples of Constantinople's palaiologan architecture, has the largest amount of Byzantine mosaics after the Hagia Sophia and Chora Church in Istanbul. The building is located in the Çarşamba neighbourhood within the district of Fatih inside the walled city of Istanbul. Theotokos Pammakaristos overlooks the Golden Horn. According to most scholars, the church was built between the eleventh and the twelfth centuries. Many historians and archaeologists believe that the original structure of the church can be attributed to Michael VII Ducas (1071-1078), others put its foundation in the Comnenian period. It has also been suggested by the Swiss scholar and Byzantinist Ernest Mamboury that the original building was erected in the 8th century. A parekklesion (a side chapel) was added to the south side of the church in the early palaiologan period, and dedicated to Christos ho Logos (Greek: "Christ the Word"). The small shrine was erected by Martha Glabas in memory of her late husband, Michael Tarchaniotes Glabas, a general and protostrator of Andronikos II Palaiologos, shortly after the year 1310. An elegant dedicatory inscription to Christ, written by the poet Manuel Philes, runs along the parekklesion, both outside and inside it. The main church was also renovated at the same time, as the study of the Templon has shown. Following the fall of Constantinople, the seat of the Greek Orthodox Patriarchate was first moved to the Church of the Holy Apostles, and in 1456 to the Pammakaristos Church, which remained as the seat of the Patriarchate until 1587. Five years later, the Ottoman Sultan Murad III converted the church into a mosque and renamed it in honor of his Fetih (Conquest) of Georgia and Azerbaijan, hence the name Fethiye Camii. To accommodate the requirements of prayer, most of the interior walls were removed in order to create a larger inner space. The complex, which was neglected, has been restored in 1949 by the Byzantine Institute of America and Dumbarton Oaks, which brought it back to its pristine splendor. While the main building has always been a mosque, the parekklesion has since then been a museum. The comnenian building was a church with a main aisle and two deambulatoria, and had three apses, and a narthex to the west. The masonry was typical of the Comnenian period, and adopted the technique of the recessed brick. In this technique, alternate coarses of brick are mounted behind the line of the wall, and are plunged in a mortar's bed, which can still be seen in the cistern underneath and in the church. The transformation of the church into a mosque changed the original building greatly. The arcades connecting the main aisle with the deambulatoria were removed and were replaced with broad archways to open up the nave. The three apses were removed too. In their place toward the east a great domed room was built, obliquely with respect to the orientation of the building. On the other side, the parekklesion represents the most beautiful building of the late Byzantine period in Constantinople. It has the typical cross-in-square plan with five domes, but the proportion between vertical and horizontal dimensions is much bigger than usual (although not so big as in the contemporary byzantine churches built in the Balcans). Although the inner colored marble revetment largely disappeared, the shrine still contains the restored remains of a number of mosaic panels, which, while not as varied and well-preserved as those of the Chora Church, serve as another resource for understanding late Byzantine art. A representation of the Pantocrator, surrounded by the prophets of the Old Testament (Moses, Jeremiah, Zephaniah, Micah, Joel, Zechariah, Obadiah, Habakkuk, Jonah, Malachi, Ezekiel, and Isaiah) is under the main dome. On the apse, Christ Hyperagathos is shown with Virgin Mary and St. John the Baptist. The Baptism of Christ survives intact to the right side of the dome.